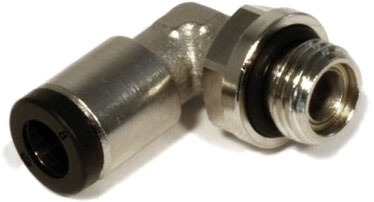 90° plug&cool fitting with cylindrical thread and o-ring gasket. Compatible to all plug&cool tubing offered by Aqua Computer (PUR hose 8/6 mm). Fitting remains pivotable after fastening. This product was added to our catalogue on Thursday, 04. October 2012.